White's Tree Frog is one of the largest tree frogs. Females can grow to a length of 4 inches, males are smaller. Color is bright green above, often with scattered white spots on the sides and occasionally on the back. It can often have an irregular white stripe or a series of white spots from the angle of the mouth to the base of the forearm. The ventral surface is white. 'Caerulea' means blue and although most of the live frogs are green, preserved specimens are blue. Captive specimens kept in low light also may lose their green pigment and become blue-green or blue. They have a pectoral fold. The fingers are about 1/3 webbed with the second finger longer than the first. The toes are approximately 3/4 webbed. They have 'suction-cup' toes which allow them to climb even glass. The animal resembles a plump 'frog buddha.' They have a supratympanic ridge that varies in size with the amount of glandular (toad-like glands) development. In obese specimens this ridge can completely cover the eyes. Vomerine teeth are present. 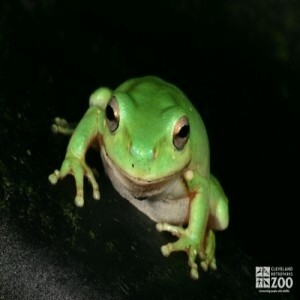 The range of White's Tree Frog is northern and eastern Australia; islands in the Torres Straits; introduced to New Guinea and New Zealand. The habitat of White's Tree Frog is arboreal and can be found in trees and shrubs. They follows human habitation and can be found in houses, lavatories, water tanks, and drain pipes. Sexual maturity in White's Tree Frogs is achieved by the second year. They breed during the summer months in grassy, rain filled meadows. Eggs are laid in still water from November to February.